There are probably more abandoned or half-dead blogs littering the Internet than there are live ones. The most common reason why photographers fail to start a photography blog, or they abandon it after a short period of time, is that they fall prey to the big myth that it’s somehow necessary to be a writer in the traditional sense. The well-known and highly successful bloggers have known about this “secret” for years, but most photographers don’t typically cross paths with the general blogging community, which leaves many of you in the dark about how to approach blogging most effectively. Photographers naturally assume that writing a blog means being a real writer, and that the strict rules taught in school about grammar, paragraph structure, and formal writing must therefore apply. For those who communicate mainly through visual means, this can be a scary prospect, and so they simply fail to start or they give up very quickly. The truth is that a blog is not meant to win literary awards or pass a high-school English exam. It’s only real purpose is to act as a conduit for nothing more intimidating than a conversation – an ongoing dialogue between the photographer and their family of prospects and clients. A conversation is simply a friendly exchange of easy-to-understand thoughts and ideas, and the less like “real” writing the blog appears, the more successful it will be at connecting and engaging with its intended audience. In effect, your blog is the more personal side of the business, which therefore influences the mode of communication. Writing for a blog has much more in common with verbal speaking than it does with traditional writing, and this is the key to modifying our writing style to make it more suitable for a blog. These are just a few of the many ideas that can help a non-writer feel more comfortable with the task of writing a more effective and conversational photography blog. By following these strategies, you will be able to build a blog that connects with your audience, creates engagement, and helps your business through improved search engine optimization. Much of what we’ve already talked about with regard to websites and SEO in general also applies to blogging, but there are some additional items you should consider when starting or writing a blog for your photography business. For example, a blog typically consists of a stream of posts published chronologically, like entries in a journal. In fact, blogging used to be called journaling when it first started. Because a blog typically includes a stream of content produced over time, some of it time-sensitive or at least related to events happening at the time, it’s not always possible (or even desirable) to optimize those posts for your primary keywords. To do that might lead to what we refer to as keyword cannibalization where you end up with multiple pages (including blog posts) attempting to rank for the same keywords. In the end, they all suffer in the rankings if Google is unable to determine which page is supposed to be the most important one. Therefore, most blog posts are designed to rank well for long-tail keywords – those keywords that have 3 or more words in them, that are not searched for as often as the primary keywords. The first step, of course, is to find a suitable topic for that next blog post. This seems to present a real challenge for many photographers, but it really shouldn’t. Create yourself an ideas file and use it to store anything and everything you can find that might serve as a resource for future blog posts. This can take almost any form, whether it be on your computer, stored in something like EverNote, or in a “hard” file of hand-written notes, clippings, and printouts. It really doesn’t matter how you organize your ideas file, as long as it makes sense to you. When writing, try to keep your blog posts focused on one small idea at a time – that way, you’ll get the best SEO results, your readers will spend more time reading, and you won’t run the risk of running out of suitable topics. Once you have a topic, it’s time to decide what your focus keyword will be. This comes right back to the topic of keyword research discussed earlier, and you can follow the same principles outlined there to identify the best keyword phrase upon which to focus your topic. If you blog using the WordPress platform, which I strongly recommend you do (with WordPress installed on your own website domain), then you’ll want to make use of a powerful SEO plugin to help make sure you keep in line with current SEO thinking and standards. One such plugin is the WordPress SEO plugin by Yoast. As you can see, you can specify your focus keyword as well as a custom title and meta description. I recommend that you take full advantage of all the features offered by the SEO plugin, as they will save you a lot of time and help prevent needless mistakes. Caveat: While SEO for your blog can really help, it is NOT necessary to focus heavily on optimizing every single post you publish. Most of your posts will be things like sneak peeks, highlights from sessions, and that kind of thing, and SEO is just not necessary (or possible) on those. Instead, focus your SEO efforts on posts and blog pages that target a specific keyword that people in your area might be searching for. WordPress allows you to put posts into categories, which essentially divide your blog content into broad subject areas, and to also attach tags to posts, sort of like keywords. It’s a good idea to only use one category per blog post, and to use only the necessary tags. Obviously, your keywords should be added as post tags. A description for your categories is useful, since this is the title text used on the hyperlink whenever a link to a category appears on the website. This gives your users, and Google, a better sense of what the category is about. Every post and page within WordPress has its own unique identifier, and the default way of representing our pages and posts is by that identifier. In this instance, the “p=999” part of the URL tells WordPress to display the post or page with the identifier code of 999. Clearly, this method is not very search-engine friendly, but WordPress gives us a handy system of displaying alternative URLs, called permalinks. There are several different permalink structures built into WordPress as standard, and you can change the current structure of your blog by going to the permalinks section of the main settings. Unless you have an overriding reason to do otherwise, I would suggest that you select the “postname” permalink structure, which will generate a permalink from the post title as the URL for that item (you can also edit that for your own purposes). This is a much more useful URL structure for SEO purposes, but don’t abuse it by trying to stuff too many keywords into it! 3-5 words in total should be more than sufficient to create a useful and unique URL. 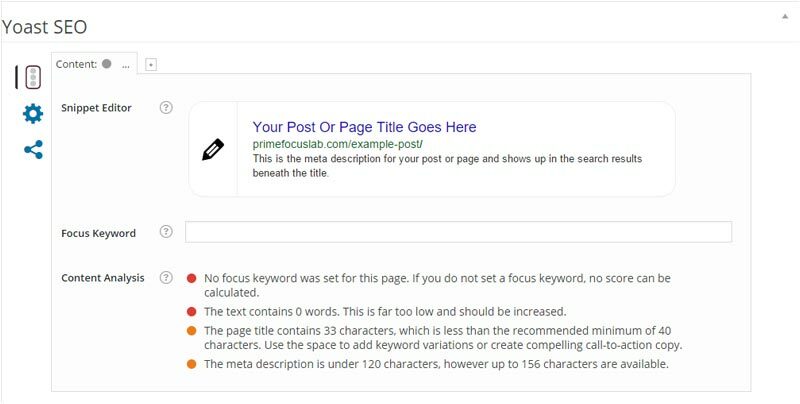 Print this page and keep it next to your computer for easy reference when you’re working on your blog to help you keep track of the important SEO elements.